Fri., Feb. 1, 2019, 8:53 a.m.
A GRIP ON SPORTS • When the University of Washington traveled across the state early in December and faced then No. 1-ranked Gonzaga, no one knew what the season would hold. At least for the Huskies. But the two-point loss might have told us more about UW than the Zags, if we had been willing to listen. Read on. • Everyone knew Gonzaga was going to be good. Special even. Heck, the Bulldogs were 8-0 going into that game even without Killian Tillie all season and Geno Crandall after Hawaii. Now they are even better, as last night’s methodical 30-point takedown of BYU before more than 15,000 in Provo showed. Say what you will about the West Coast Conference, but this Gonzaga team is special and will make noise in the postseason. The same can be said about the Huskies, as much as it hurts many folks in this area to admit it – and the “noise in the postseason” remains to be seen. The quality of play in the WCC is denigrated throughout the nation, used as a way to diminish Gonzaga’s immense accomplishments. Heck, every year it is dismissed by Pac-12 fans – many times rightfully so. Karma is a witch, though. The same slings and arrows GU fans have had to fend off for years are now being tossed toward the Huskies and its weaker-than-a-wet-paper-towel conference. 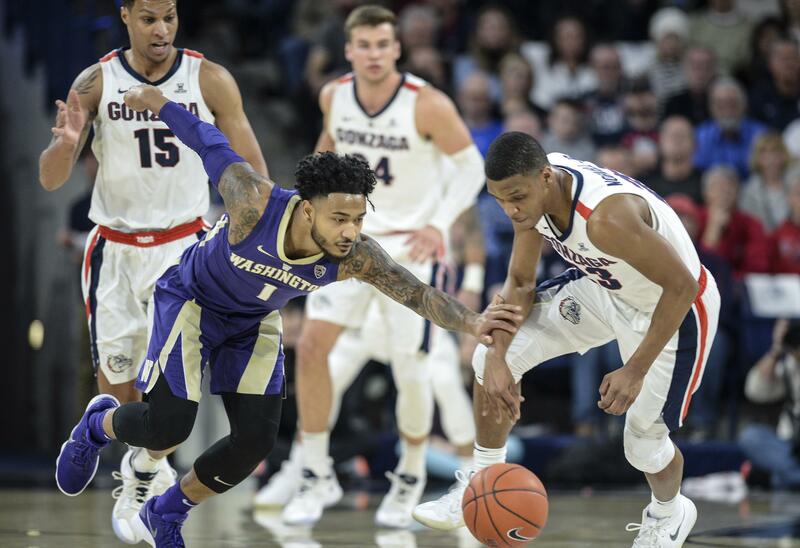 Washington’s 8-0 record and its three-game, loss-column lead in the Pac-12 standings is actually pretty impressive, no matter how down the conference is. Arizona isn’t undefeated. Neither is UCLA, the Huskies next opponent. Oregon State? Oregon? USC? Nope. Only the Huskies. Every challenge they faced, they’ve overcome. That’s all they can do. They are 17-4, they have won 10 consecutive games and they are unranked. Heck, that wouldn’t even have happened to Gonzaga 10 years ago. Well, maybe. And that’s the karma part. 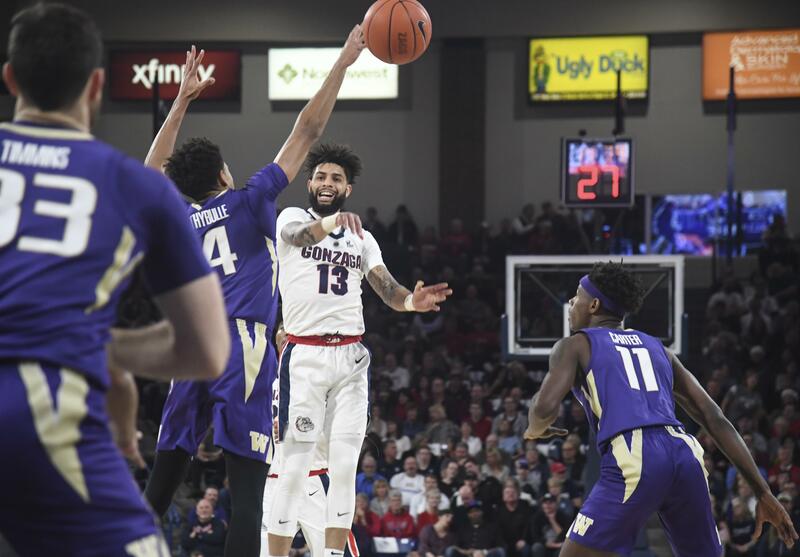 Unless you are into revisionist history – and so many folks are these days – you have to admit snooty Pac-12 fans have always looked down their noses at Gonzaga and that “little” conference it plays in. Still do, actually. But times are changing. So is the level of play on the best coast. Gonzaga has been the best program in this part of the country for a long time. And now the level of play in its conference is improving, even if it doesn’t show all that often due to the Zags’ dominance. Washington is the best basketball team in the Pac-12 this season. The Huskies are dominating the conference. They deserve more attention, more accolades. Heck, other than the hiccup in North Carolina, no one has played Gonzaga any tougher, not even top-ranked Tennessee, who overcame the Zags in a neutral-site game. If the Bulldogs are the gold standard on this side of the country (and they are), then the Huskies are the silver or bronze. And we should have realized that a couple months ago. Gonzaga: BYU was ready to show the nation it had turned a corner. The Cougars had upset Saint Mary’s last week at home, were primed to pull another shocker last night and energized the crowd with a couple of early steals and a quick lead. And then the Zags just took over. Boom. It was no contest. There have been times this season when Gonzaga has reminded me of the greatest program of my childhood, UCLA. The Bruins back then would be in a battle and then the hammer would drop. A huge run or two would end all hope. Jim Meehan saw a few of them last night in Provo and explained them in this game analysis. … He also has the keys to victory. … The folks in the office put together the recap with highlights. … I watched on TV and had my thoughts. No, I didn’t ding Dave Feldman for mispronouncing Gonzaga early. I did some research and realized he worked in Washington D.C. for a while. The prep school there is pronounced the way that drives GU fans nuts. I figured the guy had to cleanse his palate before he could get it right. … The BYU faithful left early, but at least they left impressed. … The Gonzaga women went into Stockton and held Pacific to its lowest point total of the season. … Around the WCC, Loyola-Marymount got past Pacific. WSU: Once again multiple Cougars will be attending the NFL Combine. This year it will be three. Theo Lawson tells you who they are in this story. Spoiler alert: one of them is James Williams. … Larry Weir talked with Matt Chazanow about the Cougars in the latest Press Box pod. … Elsewhere in the Pac-12, when I hear about the “transfer portal,” all I can think of is Scotty saying “I cannta lock on to another quarterback, Captain.” Is it my age or am I just a Star Trek nerd? (The answer to both of those questions is “yes.”) … The best game to watch in the conference last night was Arizona State’s overtime win over Arizona, Bobby Hurley’s first win in the rivalry since taking over in Tempe. … Oregon pressured Utah into a home loss, which evened out the standings a bit. … Oregon State’s victory at Colorado served to keep the middle bunched up. … In football, Jon Wilner looks at next year’s schedules. I just noticed the Cougars play at Oregon as the Ducks are in the middle of a three-week stretch with Washington and USC on either side. That’s a nice place to be. … Speaking of USC, will Graham Harrell help with recruiting? … Washington may get a coveted safety to actually sign next week. … Arizona State has a bright quarterback future. EWU: He’s not very big, but guard Tyler Kidd has had a big role in Eastern’s recent success. Ryan Collingwood examines his impact in this story. … Cooper Kupp spoke about his injury. … Around the Big Sky, Portland State went into Ogden and scrambled Weber State’s title hopes. … Idaho State has lost five consecutive games. Idaho: The Vandal women won at Northern Arizona. Preps: The Lewis and Clark girls are ready for the postseason. At least they looked that way in last night’s 73-50 win over host U-Hi. Dave Nichols was there and has this story and roundup. … We also have a GSL boys roundup and others from area boys and girls action. Seahawks: Hey, it’s almost been five years since the Hawks won the Super Bowl. Does it seem like that long ago to you? … Steve Hutchinson may go into the Hall of Fame as a Seahawk. … Russell Wilson seems to be everywhere. Mariners: The owners are not spending money. Again. It could bode poorly for negotiations down the road. Published: Feb. 1, 2019, 8:53 a.m.